As kids, our parents gave us permission to go out on the bike “as long as we were back before dark”. Today, many people cut rides short, leave social events early, and scramble to get home when the sun starts going down. Far too many people enjoy the downtown social life using their cars to get home when they shouldn’t be. But cycling is still possible after dark. 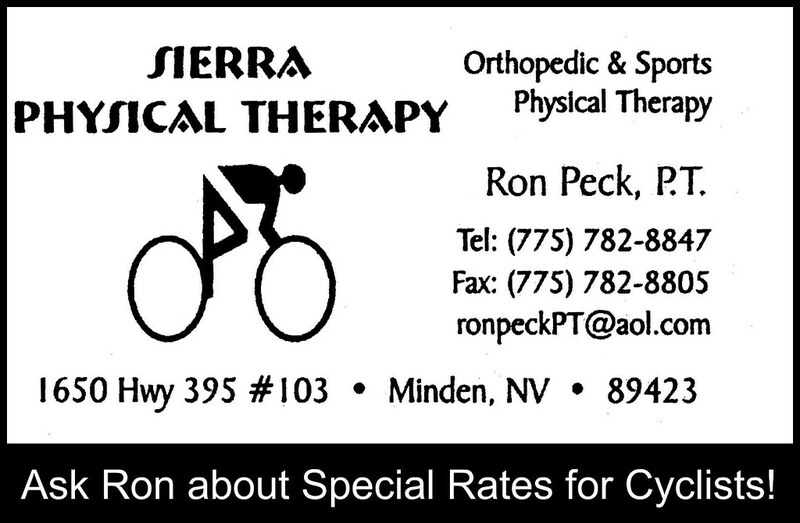 For the price of a tank of gas, you can buy some decent bicycle lights and keep bicycling year round, day or night. 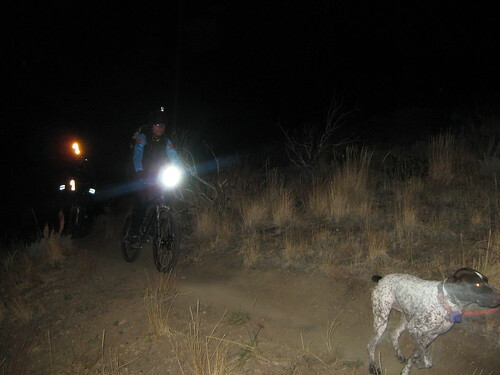 Lights can extend the hours of available mountain biking too. This is important to many riders, now that the sun is setting so early. I suspect a lot of people don’t know that riding your bike at night can be a lot of fun. Whether you’re pedaling through the dark woods, along a moonlit mountain singletrack, or cruising city streets beneath the neon lights, riding at night is an all new cycling experience. A feeling of floating rather than rolling. Less to look at and far fewer distractions. Many of your usual visual cues are not visible, and you may forget where you are momentarily if you let your mind drift. Your other senses are heightened. You might really feel the wind in your face, or notice just how loud a creek is for the first time. 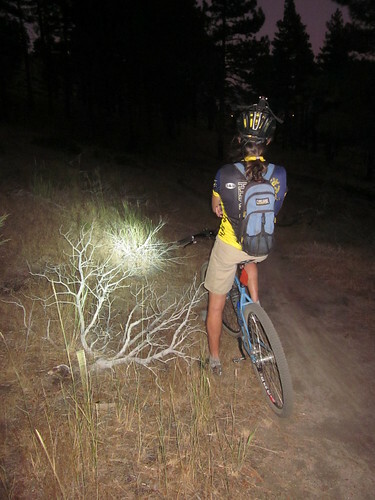 The trail you ride everyday may seem very unfamiliar at night, giving that same old trails new life. It can even be a little spooky at times. High-end lighting technology has come a long way. Thanks to LED lights, batteries are a lot more compact than they used to be, are quickly recharged, and have long burn times. Batteries are now small and light enough to be clipped onto your stem, bars, helmet, or other convenient location. Some batteries are even contained within the light, removing the need for a separate mount. How much light you need is based on what type of riding you’ll be doing. A cheap $15 light might produce just enough light to alert motorists of your presence, but not provide you much illumination to light up the road. This may be ok if you plan to slowly cruise the city streets, but you can quickly overrun your lights if you pick up the pace. A light system costing a few hundred bucks will light up your world, and will allow you to ride at the same speed you might during full daylight. Lights of this caliber would be a good choice for racing or negotiating technical terrain. My current headlight is somewhere in between. It’s a 110 lumen MiNewt from Nite Rider. For around $100, I got the light, rechargeable battery (can also be charged with a USB outlet), mounts for different sized handlebars, and a helmet mount. It’s more than enough light for riding around town at full speed, and provides me with enough light to enjoy the few night time mountain bike rides I do each year. It mounts/un-mounts easily with no tools, and fits in my pocket if I want to take it off once I reach my destination. Night riding is fun for all! 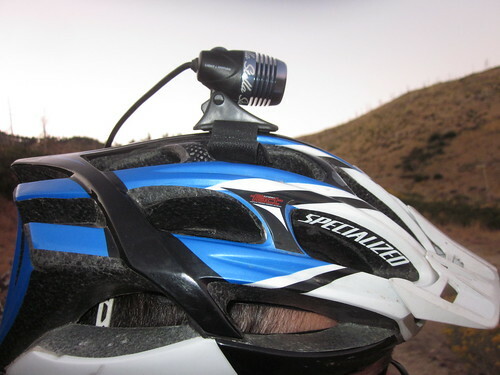 Some lights come with mounting hardware that allow you to mount the light to the handlebars or the helmet. 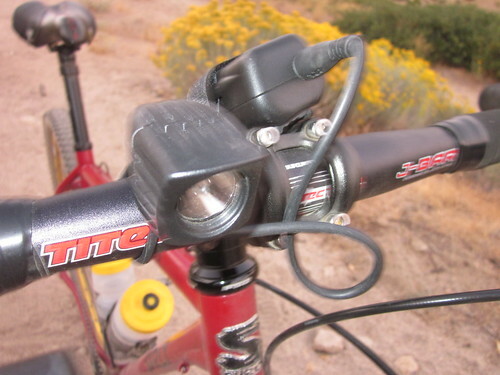 Mounting a light on the handlebars shines light where your bike is headed. A light on the helmet shines light where you’re looking. Handlebar mounted lights are convenient and adequate for most urban riding, but many mountain bikers prefer running both. Riding technical trails at speed requires that you see what’s in front of your bike, but also what’s coming up around the next turn. When doing a fast turn in the daylight, we look through the turn and use our peripheral vision to see what is directly in front of us. Running two lights allows you to do this when it’s dark. The helmet light is also nice for peering into the bushes and making sure that twig you just heard snap isn’t a mountain lion or some other large, purely imagined, carnivorous mammal. Taillights are much more affordable than headlights, since their main purpose is just to make you be seen. 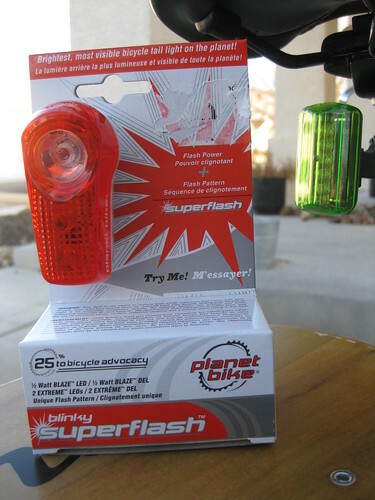 I went with a Planet Bike Superflash for around $26. It’s a bit more expensive than some of the other taillights, but it’s very bright. 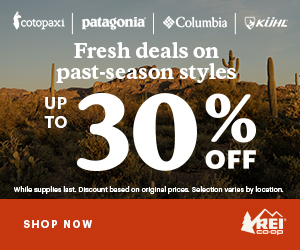 It’s a good choice for all season visibility, and has worked good even during snow storms. Some companies make little lights that can mount pretty much anywhere on the bike. You can get creative with these; for example, you might stick some on your seat tube to help increase visibility from the sides. Be seen at night. Don’t be a bike ninja! Check the forecast before you leave, and be aware of what the temperatures will be after the sun goes down. 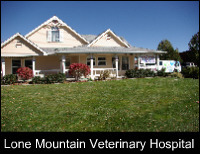 It can cool down quickly after nightfall. Wind vests, arm warmers, and headbands don’t take up much room in your pack, and keep you comfortable if you need them. It’s still a good idea to have eye protection after dark. Get some clear lenses, or wear your eyeglasses. I don’t see very good after dark without my eyeglasses, so I prefer better vision at the expense of a little wind protection. You don’t need a taillight for off-road riding, and sometimes they can bounce off the mount if you do take them off-road. I keep one in my pack though for the ride home. Once I return to the city streets, I just clip it on. If you’re wearing a light on your helmet, cover it or turn it off when you look at people to talk to them. It’s easy to forget the light is up there, and your riding buddies don’t appreciate being blinded. Don’t leave your expensive lights on your bike when it’s unattended on the bike rack. You could easily lose your investment and have to ride home in the dark. 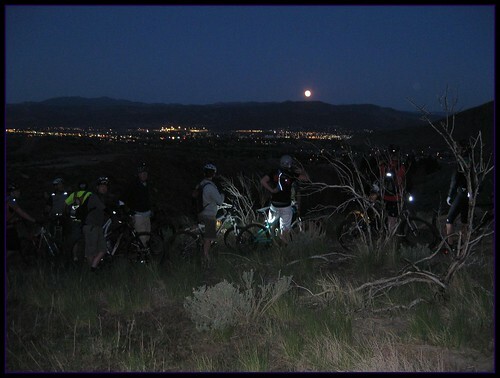 Do you have any night riding tips to share? What lights are you using? Brilliant post and reminder of the joys of nite riding! Thanks for writing it. I learned 2 categories of headlights, “be seen”- 1 or 2 LED like the Knog Frog and “to see”- 3+ LED/halogen etc. Like my main light the Planet Bike 1/2 watt or the MiNewt. As mainly an urban cyclist/commuter I have tried all kinds of set up. Except for the expensive ones that shine daylight from your handle bar. 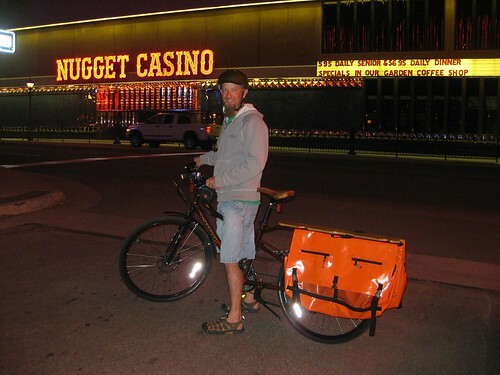 I found that, atleast here in Reno, helmet mounted light don’t really work. My standard is bar mounted and at times of bad weather, fork mounted. Like fog lamps. The rear blinkies I like the most are Serfas or Nathan. Yes indeed, it is that time of year. My friends and I refer to it as “Lights and Tights” time. A nearby park opened a new single track trail system and it has been really fun for night riding. Throw in the horse trails and you have the entire park to yourself on some nights. They also have a section of lighted xc ski trails and they are keeping the lights on in the evening until 10 p.m. to encourage more people to use the park. I would also agree that the two light system (handlebar and helmet) is the only way to go for mtn. bikers. Lights and Tights. I like that! You would think that summer would be great for night riding, but by the time it gets dark, I’m always too tired. Today the sun sets at 6:43PM. Plenty of time to ride before bed! Jeff, this is a great post. Night riding is a passion of mine and I am constantly on the look out for affordable and effective lighting systems. For this fall, lighting systems have recently made big improvements in cost per lumen. Currently we have available 500 & 600 lumen lights with a light weight self contained battery for $150 & $160. The 250 lumen light for $85!!! It is amazing where lighting technology gone in such a short time. Wow! And today is pay day too. Hmmm…. Damn you both!!! And here I run across jeff with his new fancy light as I am scrambling to get home before it is to dark TWO nights in a row…. Looks like I will be paying a visit to you Denis.. Fantastic post! It really gives someone the idea that you can continue to enjoy urban riding as the seasons change with some basic lighting. And once you find out how much fun it is to ride at night, you can graduate to the “big boy” lights. I’ve used the minewt series for trail riding for the last few years and for around $99 the entry level product is a great bang for the buck. It also has the ability to swap between mountain and urban use in seconds. On my commuter I use the planet bike one watt (wired version with dynohub)….once you find the joy of no batteries required you never go back! Planet bike super flash has the rear on all my bikes. the guy that was pulled over was just in the shop and that’s lame the cops bored? what was the guy going to steal riding his bike? the guy was on a regular bike not even xtra cycle. another tip for the guy that rides at nite reflective tape. i had no luck selling it but it does come in black for the cool kids and red for us that want to look safe but you shine a light on it and it looks like you have lights. i have some in my tool box and i put a little on my seat stays and if you loose your lite your still legal. 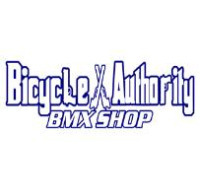 In regards to having your bike “legal” for night riding on the street there are three requirements. lamp visible from both sides from 500 feet away. 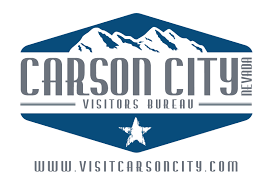 legal in carson means what they look for to give you a hard time.they look for lights have lights your cool. plus there is a fourth requirement but posting it would be lame.it would increase sales but i can’t do it,but i do have both styles in stock.